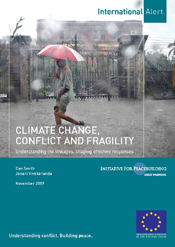 Rebecca Sargent at a piece of conflict has been reading CLIMATE CHANGE, CONFLICT AND FRAGILITY - Understanding the linkages, shaping effective responses (pdf), a report by Dan Smith and Janani Vivekananda of International Alert (It's from November 2009 and a copy of it has been waiting on my hard disk for me to read it for quite a while now. But why not check out Rebecca's take on it right away?). One needs only see the example of the Haitian earthquake, the current flooding in Pakistan or even the aftermath of hurricane Katrina in the southern US to know that extreme weather can have an effect on peace and security in an area. [...] Current international negotiations on reducing global warming and responding to climate change almost entirely ignore the aspect of this heightened risk of conflict. [...] Managing water supply is vital. Not only is it necessary for human life, but water shortages also affect agriculture causing increased food insecurity, especially for the poor. [...] Water shortages and food insecurity often lead to violent conflict where poverty, weak governance, political marginalization and corruption reign supreme. [...] Migration of people increases the likelihood of conflict, as newcomers are seen as an unwanted burden that compound social pressures or even transfer conflict from one location to another. Attempting to block immigration with regulations and physical barriers may exacerbate the conflict risk. 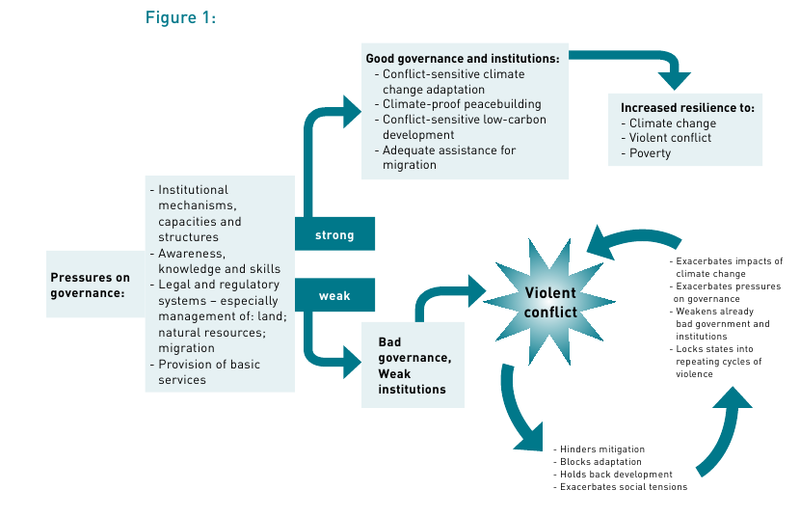 Good governance means increased resilience to violent conflict or poverty. [...] Many rich countries will be simultaneously shifting to low-carbon economies to meet demands on climate change adaptability. This shift must be peace-friendly and supportive of the adaptive development happening in poorer countries. For example, a switch to bio-fuel in richer countries caused food prices to rise by 30% in 2008, which directly caused violence in over 30 countries. If these crises are compounded and not isolated to one location within a nation, or result in large-scale destruction of entire areas, even rich states may be unable to deal with the crises that emerge. The expectations in richer states for action is higher, therefore state failure may be reacted to with all the more intense violence. It is wrong to imply that henceforth there will be old-style development with adaptation on top. [...] it seems likely that much and probably most expenditure on adaptation will simply be indistinguishable from expenditure on development because the activities will be fused. Adaptation to climate change needs to be conflict-sensitive. Peacebuilding needs to be climate-proof. A low-carbon economy must be supportive of development and peace. Poor countriesâ€™ social capacity to understand and manage climate and conflict risks must be strengthened. Climate-related migration should be planned for and coped with peacefully. This is a ticking time bomb just waiting to go off! Hopefully we will be able to handle this in a civilized manner. But somehow I really do doubt that. not sure if my last comment went through but we really wanted to say that we're rooting for this to be handled with minimal conflict. We also just added green blog to our green directory and wanted to comment to say thank you. sit on a powder keg that has exploded. So is this world. It only depends on when it will explode and when it will wreak havoc. Designer handbags are daily needed. Our cheap Designer handbags are all designed at cheap wholesale price. There are variety brands and styles of designer handbags designer handbags on sale.